The incident occurred on July 10, 2009, outside of Uniontown, in Fayette County. 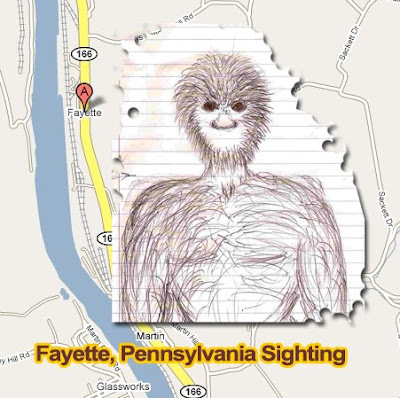 On July 15, 2009, a team from the (Pennsylvania Bigfoot Society) PBS traveled to the location where the reported Bigfoot encounter occurred to interview the witness and to look over the area for any possible physical evidence. The team was comprised of Eric Altman and PBS members Dave Dragosin and his wife Cindy. When we arrived on the scene, the witness and her husband were awaiting us. The creature, which walked upright on two legs, had a head that was said to be large and elongated, and covered with hair that just looked wild. The neck was somewhat hard to explain since it was covered in hair. The witness said that it appeared to be thin and long. The nose was flat and dark, but was also mostly covered in hair. The eyes were dark, possibly black in color, wide set, and “wild looking.” The witness thinks that is why the eyes looked so odd. The wild look and the fierceness of the eyes of the creature, scared the woman. The creature was stocky and muscular in appearance. 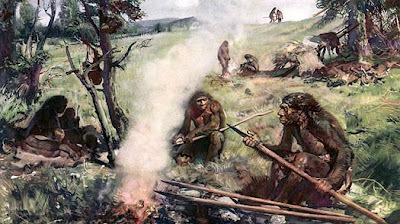 The witness said the hair on the arms was long, like ape hair. The witness had the impression that this creature was older in age. At the scene, Dave Dragosin sketched an illustration of the creature under the direction of the eyewitness. Eric and the witness’s husband searched a wooded area not far from the location of the encounter, but nothing of interest was found. The scratched area was about 8.5 inches long and 2 inches wide. The witness told me that after the encounter, she drove down the road a short distance and parked her car. The fast movement of the creature and the way it leaped over the trunk. The eyes of the creature frightened her. Cryptomundo has some photos of the sighting location here. I just got the coolest gift. It is Sasquatch folder made by the Corolina Pad company. They have a bunch of products made from recycled materials under the brand Sasquatch Leave Nothing But Tracks. Sasquatch lives deep in the forest, far from where most humans dare to go. He lives off the land, and except for a footprint now and then, leaves little trace of his existence. Sasquatch lives a green life, using only what he needs. Carolina Pad is trying to follow in Sasquatch's footsteps. We know that forests are one of our greatest treasures. What Makes Sasquatch Products Eco-friendly? Sasquatch™ Brand products use less virgin wood products. They are made of mostly recycled paper. This means fewer trees are cut down and less water and fossil fuels are used during processing. This helps reduce air and water pollution and helps protect wildlife from harmful chemicals and habitat changes. It seems to reinforce this trend we have seen lately in the world of Bigfoot, Bigfoot as a mascot for environmentalism. Thank you for the gift Julie!!! Lyoyd Pie is a UFOlogist ala Zacharia Sitchen. Now there is a camp (pun intended) of Bigfooters who believe UFOlogist should stay away from Bigfooting. I would say The Bigfoot Lunch Club falls into this camp. Bigfoot as an inter-dimensional extra-terrestrial biological entity goes against the grain of the credibility many scientists and researchers have spent much of their sweat equity on. Prominent cryptozoologist Jeff Meldrum and Loren Coleman would prefer to study fossil records and modern primates as oppose to exclusively searching for clues in ancient Babylonian texts. My very moniker, Epic Gilgamesh, gives away I am at least interested in Babylonian kings, but mostly because it is the first recorded relationship between a mortal (1/3 mortal anyway) befriending a wild-man. Enkidu is probably literature's first bigfoot, in my humble opinion. Going back to Pye, you can go to his Hominoids website to judge for yourself whether or not he has a place in Bigfooting. I will say this, although we disagree with his theories, his theories do suggest a great amount thought and are well constructed. Below is an audio interview where he talks about human origins and what he calls hominoids A.K.A. Bigfoot. VANESSA WOODS, author of "It's Every Monkey for Themselves", is an award-winning journalist who has a double degree in biology and English from the University of New South Wales. 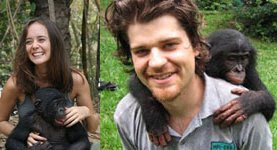 She is a researcher with the Hominoid Psychology Research Group and studies the psychology of bonobos and chimpanzees in Africa.